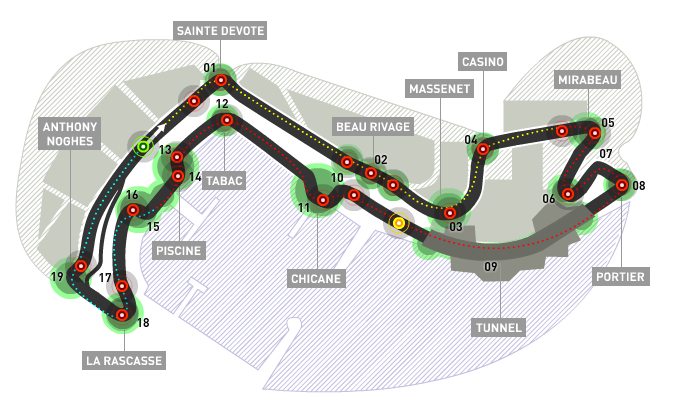 In motor sport, there is something called the ‘Triple Crown’ consisting of the three most famous circuits in the world. One of them is the Monaco Grand Prix. The other two are the Indianapolis 500-Mile race and the 24-Hours of Le Mans. If a driver wins all three races (by competing in all three different variations of motor sport), he will have completed the ‘Triple Crown.’ The only driver to have done so is Graham Hill. Juan Pablo Montoya who won the Monaco Grand Prix in 2003 and the Indianapolis 500 in 2000, is the only driver still racing who has won two of the three races and thus is the closest to completing the Triple Crown. Webber is 1/3 of the way there. Hasn’t the Australian really come into his own all of a sudden? Previously I would feel as though Webber’s brief visit to the spotlight was to be short lived. Because of that, I never took him quite too seriously, until now. He is leading the championship, two poles and two race wins in a row, tied with his German teammate. 1. Alonso pit on lap two from soft to hard. That was genius from Fernando and Ferrari. All that is required from drivers is to use both tire compounds throughout the duration of the race. Alonso used the super soft tires (even if it was for one lap) and then pit for hards on lap two as the Safety Car was deployed. That meant he would have looked set to complete the race without pitting again. 2. Mercedes engine fails in Button’s car. That’s not a very good sign. I know it’s only one failure but the Mercedes engine is supplying to more than just McLaren (Mercedes and Force India). To make matters worse, Button was driving under the safety car when his engine decided to fail. Imagine what strains the car would have been under if he was driving at full speed. 3. Schumacher passed Alonso on the last turn of the last lap. …the cars will take the chequered flag as normal without overtaking. That clearly means Michael Schumacher’s overtake on Alonso is illegal. But, at the same time, you need to look at what the drivers and teams were exposed to during that time. According to an Autosport.com article, Ross Brawn is arguing that they were informed that the Safety Car was coming in, meaning that the race will resume. However, on any circumstance, the Safety Car has to come in even on the final lap. Never does the Safety Car cross the finish line on the final lap unless the weather is causing visual impairments. At several points during the race, Webber was lapping 0.6 seconds quicker than Vettel in second place. That is incredible seeing that they both drive identical cars with similar fuel loads. Webber also had the clean air advantage and the open track in front of him, but that was shocking. Webber is really coming into his own. Champion contender indeed. 5. Hard tires lasted 77 laps for Alonso.. not something we want. As soon as Alonso pit, on lap 2, I was glad that Ferrari seized such a great opportunity. That strategy, combined with Alonso’s fearless passes through the back of the field, really paid off. Something about that strategy, however, bothered me. One set of hard tires was able to last the full race distance. That is definitely something that should be revised by the FIA. That is one of the biggest problems for our sleepiness and the lack of entertainment. I love controversy. It is what keeps the sport alive. From the McLaren-Ferrari scandal, to Renault crash-gate, it really forces fans to consume themselves in the sport. These are good for the sport, in my opinion. They create a buzz, big, big news. And news, regardless of it’s nature (good or bad) is good news. Webber is king at the moment and I can see a kingdom forming shortly. Driver of the day: Mark Webber for his abnormal speed and consistency. Moment of the day: Barrichello throwing his steering wheel. “I throw the steering cause wanted to get out as soon as possible. After the shunt I was facing the wrong side of the track and car was on fire,” Barrichello explained on his Twitter account. I don’t blame him, then.